You only hire top performers. However, hiring skilled employees is only a portion of the battle. Keeping your competition from plucking your best talent is the rest of the war. Company culture has a direct correlation with your employees’ satisfaction and morale. A good meal every day isn’t everything you need to do to ensure you’re fostering a corporate culture that will keep employees happy, but you shouldn’t discount or underestimate the power of good food either. A corporate cafeteria POS should make obtaining a meal at work quick and nearly effortless. Your employees are busy ensuring your business is successful; keeping them well-fed will go a long way to ensuring they are delivering quality work and results. You don’t want to eat the same thing every day; your employees certainly don’t either. With menu customization, you will be able to customize breakfast, lunch, and dinner meal period times. What’s more, ensuring that you are able to automate these menus will be a life saver. With automatable menus, you can set it and forget it, allowing the rotations you’ve customized to run until you’re ready to update them again. Making payments easy for your employees goes a long way to improving their corporate cafeteria experience. Your skilled employees have a lot on their plates and they’ll likely want to get back up to their offices as soon as possible to return to their work. Offering multiple payment options will allow your employees to pay in the most convenient way possible for them. You’ll want to make sure that you not only have Credit and Debit capabilities, but also EMV and NFC options available as well. Mobile wallets are increasing in popularity with apps like ApplePay, Android Pay and Google Wallet. With NFC technology at your check out, your employees will be able to quickly check out with their smartphones. Another option you would do well to consider is employee charges. With employee charges, your employees would have the ability to replenish their accounts or charge their meal purchase to their account with a payroll deduction. This option will streamline your transaction processes the most, allowing employees to simply swipe or tap an employee ID or charge card and move on, allowing the person behind them to quickly check out the same way. 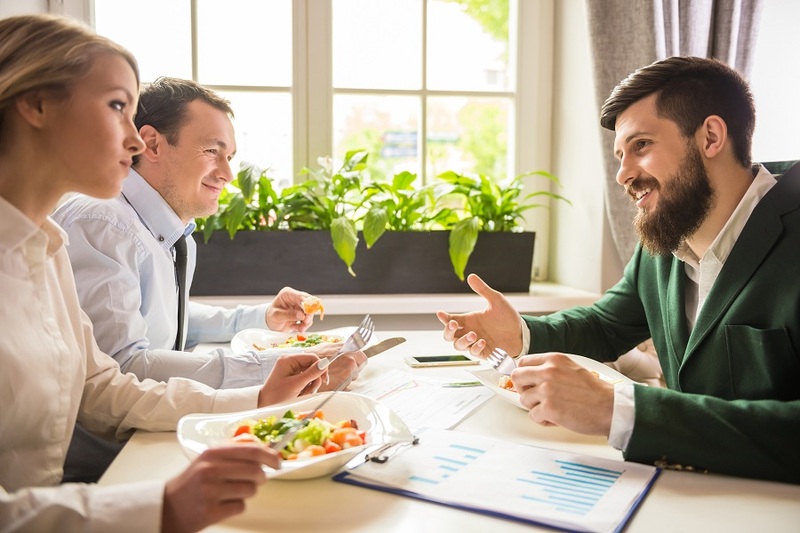 Though your corporate cafeteria is there to feed your employees and make sure they have a good meal in their stomach before continuing on with their day, it’s also a business and should be treated as such. Your corporate cafeteria is very similar to a quick service restaurant as its goal should be to get people in and out through the checkout line as quickly as possible. And, like quick service restaurants, two of the largest expenses that you will shoulder are labor and inventory (see the bullet below). For this reason, it is essential to have good labor optimization features as part of your corporate cafeteria POS system. With sales data, you’ll be able to predict when you’ll have an influx of traffic and when you’ll have some slow periods. Using this data, you can schedule your kitchen staff and cashiers accordingly, optimizing for peak traffic times and cutting back during low traffic periods. Corporate cafeteria POS will also make payroll a breeze, since staff can just clock in and out in the POS system. In a kitchen, inventory management is critical. To ensure that your corporate cafeteria is reducing shrinkage and optimizing profits, proper inventory control is essential. Your corporate cafeteria pos system should be able to accurately track your inventory by ingredient, subtracting from your numbers after each sale. Notifications can be set to alert you when certain items or ingredients are running low, enabling you to place a restocking order and preventing you from running items out of stock. You may also even be able to automate restocking orders by setting reorder benchmarks and setting the system to send the order for you. In this way, you’ll prevent spoilage contributed by overstocking perishable items, and you will never disappoint your top performing employees by telling them that their favorite meal is currently out of stock. What’s more, you’ll find that your corporate cafeteria POS system will provide a solid return on investment as it mitigates expenses and reduces shrinkage. Ultimately, your corporate cafeteria should contribute to a positive corporate culture, while also being handled like the business it truly is. In order to do this, your corporate cafeteria POS system should possess all of the above features. If keeping your employees satisfied while simultaneously generating a solid ROI is important to you, a corporate cafeteria POS system is for you.